$20.1 million for the prior year. Ended the year with approximately $131.5 million in cash and no debt. in both the frequency and severity of hot flashes compared to placebo. phase 3 Rejoice Trial in the peer-reviewed journal Menopause. allowed and 17 issued U.S. patents. company’s bio-identical hormone product candidates, if approved. increase in the number of units sold. expenditures, and personnel costs to support future commercialization. 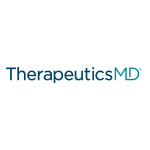 million, or $0.49 per basic and diluted share, for the full-year 2015.
viewed and downloaded at its website: www.therapeuticsmd.com/pressreleases.aspx.